One of the most celebrated diplomats in modern history, Kofi Annan was probably best known as former UN Secretary-General. He was a vocal supporter of international peace and the rule of law, praised by fellow human rights advocates as a great statesman and a committed internationalist. News broke on Saturday that Kofi Annan, a Ghanaian politician and former UN Secretary-General, passed away in a hospital in Bern, Switzerland at the age of 80 after a short illness. 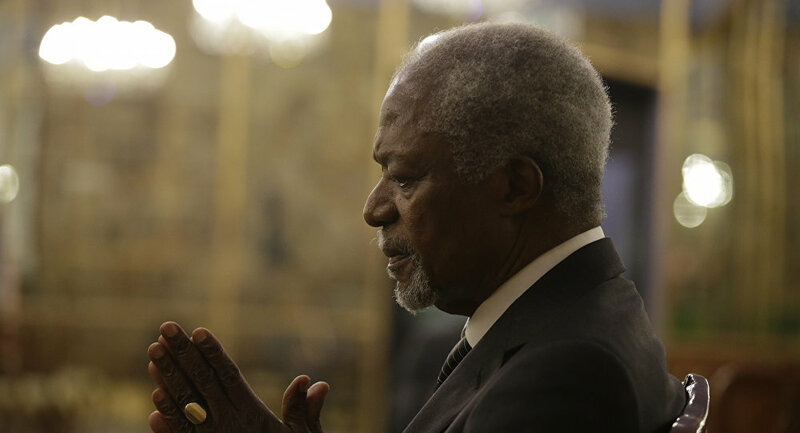 As the world is mourning over the loss of Annan, described by his foundation as a "global statesman and deeply committed internationalist", Sputnik takes a look at his career, which spanned over five decades and saw a handful of triumphs and tribulations. Born into an aristocratic family in Ghana in 1938, Annan earned a degree in economics at a Minnesota college, studied international relations in Switzerland and management at MIT. He began his career in the UN system in 1962, working as a low-ranking officer at the World Health Organization's Geneva office. He later served in the Economic Commission for Africa in Addis Ababa, the UN Emergency Force in Ismailia, the UN high commissioner for refugees in Geneva, and in various senior posts at the New York headquarters. Prior to taking the top UN post, he was in charge of UN peacekeeping efforts between March 1992 and December 1996. During his time in office, a genocide campaign left around 800,000 Tutsis and moderate Hutus dead in Rwanda within just three months in 1994. Annan was criticized for failing to halt the massacre. Despite the Rwandan catastrophe, in 1997 Annan took over as the seventh Secretary-General. He pushed for reform to renew the UN system and improve its management and coordination. In March 2005, Annan presented a progress report entitled "In Larger Freedom." The document largely focused on modernizing the Security Council, which at that time was slammed as inefficient for its failure to prevent a war in Iraq two years earlier. He proposed expanding it from 15 to 24 countries, either adding six new non-veto-holding permanent members or creating a new tier of semi-permanent members, but the plan wasn't put into practice. The much-criticized Human Rights Commission was replaced by a new Human Rights Council in March 2006, as recommended by Annan in his 2005 report. At the end of March 2000, Kofi Annan released a report "We the Peoples — The Role of the United Nations in the 21st Century," widely known as the Millennium Report. In the document, he laid out a vision for the UN in the age of globalization and offered an action plan to make globalization work for people everywhere. The most comprehensive presentation of the UN's mission in its fifty-five year history, the report contained numerous specific goals and program initiatives. In 1998, Annan helped to promote the transition from military to civilian rule in Nigeria. The following year, he supported East Timor's move towards independence from Indonesia. In 2000, he endorsed Israel's withdrawal from southern Lebanon. In April 2001, Annan issued a five-point Call to Action to address the HIV/AIDS pandemic and called to create a global AIDS and health fund. Kofi Annan and the UN co-received a Nobel Prize for their fight against the spread of the HIV virus in Africa, his declared opposition to international terrorism, and prioritizing human rights. He also condemned the US-led war in Iraq, which began in 2003, saying that it violated the UN Charter. "I have indicated it was not in conformity with the UN Charter. From our point of view and from the charter's point of view it was illegal," he stressed. In 2007, after leaving the UN, Kofi Annan set up the non-profit Kofi Annan Foundation to work on international peace and security, sustainable development and human rights. He has also been a member of The Elders, a human rights group of former world leaders, since its foundation in 2007, and chaired the organization in 2013. In 2012, Annan was the UN-Arab League special envoy to Syria. His six-point peace plan for the ongoing conflict asked the Syrian government to end the use of heavy weapons and pull back military deployments in and around population centers, while Annan would seek similar commitments from other sides of the conflict, including the Syrian opposition. In August 2012, he stepped down from the post after becoming frustrated with the UN's lack of progress in conflict resolution. In September 2016, he headed a year-long UN commission to investigate the refugee crisis in Myanmar.